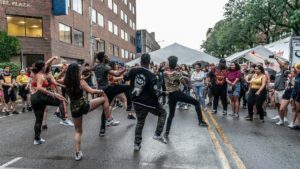 AS220 Youth provides art-making workshops at its downtown Studio, the Rhode Island Training School (RITS), Nowell Leadership Academy (NLA) and UCAP, the Urban Collaborative Accelerated Program. Classes in photography. dance, music, painting, fashion, and more are offered free of charge five days a week. Youth are given the opportunity to exhibit or perform work created in the workshops at the end of each term and at public events throughout the year. In addition, young people develop personal portfolios that can be used to open doors to higher education and employment. Young people aged 16 and older can apply to be an AS220 Youth Apprentice. As an Apprentice, youth are paid to produce studio events, help manage program elements such as recruitment, facilities and membership, and assist with community projects. Local artists, organizations, businesses and schools are encouraged to hire Youth members for high quality and affordable services. Services include — but are not limited to — recording, live sound, performances, product design, murals and media services. Young people participating in workforce development attain both college and career readiness skills, and learn how to work with clients, meet deadlines, promote their business, collaborate with coworkers and much more. Apprentices can then graduate to our Teaching Assistant program, which is geared towards young adults who have a growing interest in becoming a teaching artist. TA’s have a high degree of responsibility within the program and are expected to help teach classes, mentor younger/new students, and facilitate aspects of the Youth program such as recruitment and administration. TA’s will develop professional skills that help prepare them to be successful in the workforce.